The PICDEM™ 2 Plus Development Board makes it easier to develop projects using the capabilities of Microchip’s 8-bit microcontrollers, specifically 18-, 28- and 40-pin PIC16FXXX, PIC16F1XXX, and PIC18 devices. 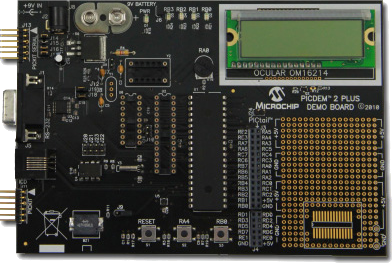 The PICDEM™ 2 Plus can be used as a standalone demonstration board with a programmed part. Alternatively, it can be used with an in-circuit emulator (for example, MPLAB® Real ICETM) or with an in-circuit programmer/debugger (such as MPLAB® ICD 3 or PICkitTM 3). Microchip offers a bundle of the PICDEM 2 PLUS and the MPLAB® ICD 3, called the MPLAB® ICD 3 Evaluation Kit (with PICDEM 2 Plus), product number DV164036. Sample programs are provided to demonstrate the unique features of the supported devices.